Biting forces in this simulation model (of a common malocclusion) are completely borne by the second molars, placing heavy forces on those teeth. These patients cannot even get the other teeth to touch. This makes chewing very inefficient, and can lead to dietary modification and digestive problems. 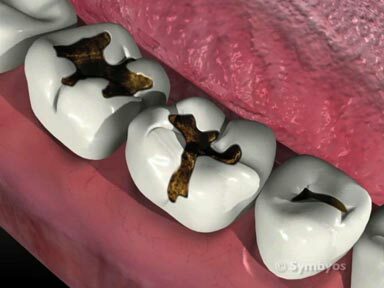 It also makes the second molars high risk for fractures. The term equilibration literally means “to establish balance or equality.” With regard to the jaw joints, jaw muscles and teeth (the stomatognathic system), it means adjusting the way the teeth mesh such that when the jaw muscles are at rest, and the jaw joints are in a stable, neutral position, the teeth are engaging uniformly with equal contacts between the upper and lower teeth. 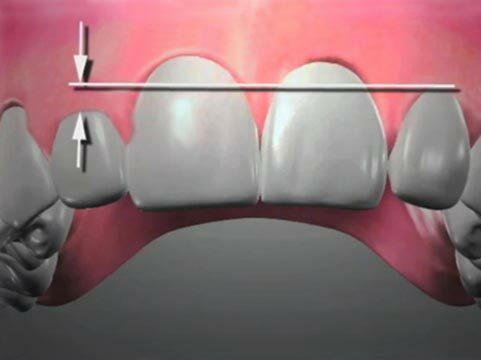 The importance of equal forces on the teeth is intuitively easy to understand. If only a few teeth engage when a person bites together, those teeth will endure much more force than they are structurally able to withstand. They will wear excessively (a condition called attrition), chip, crack, or the patient will (often subconsciously) continuously move their jaw in an attempt to locate a position where the forces are more in balance. Unfortunately, repositioning the jaws to provide balanced force distribution on the teeth may not be possible, due to crowding or misalignment of the teeth. The problem of poorly distributed bite forces on the teeth is magnified if teeth are lost. Casts of the patient’s teeth have been constructed from green dental stone, and mounted on a jaw simulation tool called an articulator. The teeth have been painted red to clearly show where adjustments are made and give an idea of how much tooth structure would need to be removed. The patient’s jaw muscles may become fatigued (myalgia) by continuously trying to achieve a position of balanced force distribution on the teeth. The muscles may also become painful. 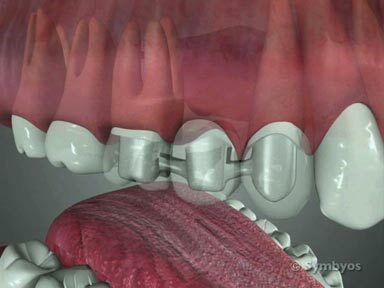 The patient may chronically grind (brux) their teeth until they wear the teeth into a position of more equal force distribution. The jaw joints themselves may be the weak link, and develop popping, clicking, grating (crepitus) or pain from the unequal balance of forces. Collectively, these symptoms represent various stages of temporomandibular joint (TMJ) dysfunction, or TMD. To understand the process of equilibration, it is important to understand a little bit about how the temporomandibular joints (i.e. the jaw joints) work. They are not pure hinge joints like knees or elbows. Instead, only the first 15 degrees or so of opening is rotational (hinge). With further opening, the lower jaw begins to slide along the skull base until it reaches the maximum opening. It is the only joint like this in the body. The areas where green stone is showing through the red paint show the adjustments that were made to the casts to achieve balanced forces. A well-equilibrated bite relationship was able to be established in this patient with surprisingly little removal of tooth structure. In order for this type of motion to be possible, the lower jaw (mandible) must be free to move in all three dimensions (forwards, backwards, and side-to-side). It does that by contraction of the different jaw muscles in a 3-way “tug-of-war”. The distance the jaw can move in any direction is limited by the length of the muscles that move it the opposite direction. The stable position is one in which all of the muscles are neutral and not contracting (pulling). If the teeth do not touch evenly with the muscles in that position of balance, problems can occur. Casts of the teeth are made and the bite relationships between the upper and lower teeth (occlusion) are analyzed. Diagnostic equilibration is performed on the casts. This may include both removal of the cast stone tooth structure, and adding tooth structure using wax or tooth-colored filling material (diagnostic waxup). The equilibration procedures (tooth removal only) performed on the casts are completed on the patient’s teeth. This step may involve multiple appointments, and may be done under sedation so that the dentist can freely manipulate the patient’s jaws without resistance from the patient’s jaw muscles. If the patient will require restorative dental treatment (fillings, onlays, crowns, etc.) following the equilibration, those procedures will be performed and billed separately. Phase 1 involves duplicating the patient’s teeth in dental stone, and recording the relative positions of the upper and lower teeth when the jaw joints are in a stable position and the muscles are at rest (dentists call this the centric relation position). Traditional steps involved with that process are listed. (Note: the emerging and controversial science of neurological dentistry may involve performing certain steps in this process differently than what is listed). The dentist will have you rest your front teeth on a tongue depressor for a few moments to allow the jaw muscles to relax. You may notice that you cannot develop the same level of muscle contraction force when only your front teeth are in function. This is known as proprioception (nociception), and reflects a neruological feedback mechanism between your brain and the front teeth that prevents your jaw muscles from contracting too heavily when only the front teeth are in function. The dentist will be able to tell when the muscles are at rest, because it will be possible for the him/her to move your lower jaw for you. Once the dentist can manipulate your lower jaw without resistance from your jaw muscles, he/she will gently position it into the stable centric relation position. The relative position of the upper and lower dental arches in the centric relation position will be recorded using any of several bite registration materials (silicone, wax, etc.). The result is called an interocclusal record. Next, impressions will be made of your teeth, and a dental stone material resembling wet concrete is poured into them. When the dental stone hardens, it produces a very accurate replica of your upper and lower teeth. Figure 1: A facebow is used to transfer the location of the patient’s upper teeth (relative to their jaw joint) to an articulator, a jaw simulation device. A device called a facebow (Figure 1) is used to record the position of the upper teeth relative to the ear hole (external auditory meatus), which is very close to the hinge axis of the mandible. The stone casts of your teeth will be mounted onto a jaw simulation tool called an articulator (Figure 2), with the teeth positioned correctly in the device using the facebow and interocclusal record. The second phase is done in the dental laboratory. Here the dentist studies the way the teeth fit together, and devises a series of steps to evenly distribute the bite forces to as many teeth as possible. The plan may involve reducing certain teeth significantly, and building them back to a shorter height with crowns or onlays. Other teeth may need to be made taller. Once the treatment plan for equilibration has been developed, the dentist will review treatment options with you. If modifications to several teeth would need to be made, or if the teeth would need to be reduced so much that restorations (fillings, crowns, onlays, etc.) would need to be done, consider your treatment options and discuss them with your dentist. Keep in mind that orthodontic and orthognathic surgery do not involve modifications to the teeth that must be maintained for the life of the patient. You may be sedated for the procedure if maintaining the centric relation position will be difficult. Using the diagnostic equilibration casts as a template, the dentist will make the same adjustments to your teeth, generally in the order they were made on the casts, verifying that each adjustment produces the corresponding new contacts on the teeth that were observed in the diagnostic equilibration. After each adjustment, the dentist will check the way the teeth are contacting using a bite marking ribbon, and verifying that the centric relation position of the jaws is being maintained throughout the process. When the adjustments are completed, the dentist may elect to administer topical fluoride to help re-establish a less porous enamel surface to help reduce the chance of post-operative sensitivity and to make the enamel more resistant to tooth decay.